That is the mission of the Schumacher Family of Dealerships. It is the driving force behind the hard work and sincere commitment on the part of our team to provide you with the best automobile shopping experience possible. Value and quality in the products you choose is just the beginning. Service and commitment is long lasting. For over 40 years Schumacher has been an organization that people know to be of the highest integrity, providing world-class products and a sincere focus on your ongoing satisfaction. Our customers and employees are our greatest asset and we respect and value their contributions. The Schumacher Family of Dealerships has proudly served the Palm Beaches for over 40 years as a highly respected, family owned business that carries some of the most popular names in the automotive industry. Collectively Buick, Pontiac, GMC, Saab, Mitsubishi, Volkswagen, Subaru, Hummer, Infiniti and Chevrolet provide a variety of cars, trucks, sport utilities and cross over vehicles that offer something for everyone in your family. The Schumacher organization strives through the hard work and sincere commitment of their team of over 350 employees to provide the best automotive shopping experience available. It is our mission to “Serve Customers for Life”. Commitment to our customers and providing quality service is evident in our world class state of the art facilities, world class products and the finest employees in the industry. 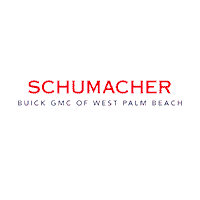 Schumacher Buick GMC of West Palm Beach opened its doors in 1971 on Okeechobee Boulevard. Richard Schumacher brought his family to the Palm Beaches after a highly successful career as a Ford dealer in the Chicago area. He immediately embraced the community and began a philosophy of service to customers that would carry on for generations. It was not long after opening Schumacher Buick GMC of West Palm Beach, that Richard and his team became the number one Buick dealer in the State of Florida. After his graduation from Southern Methodist University, his son Chuck returned to Florida to open and operate the highly successful, Bay view Buick in Port Richey, Florida for his family. He soon returned to run the Palm Beach store and quickly led the sales team to become the number one Buick dealer in the nation. With keen business acumen and an unrivaled reputation, Chuck continued to build the business adding Oldsmobile in 1989. Chuck carried on the family tradition of ownership in 1997 when he purchased the current Northlake Boulevard location, offering Mitsubishi, Volkswagen, Pontiac and GMC Truck. He added Buick and Oldsmobile to that dealership shortly after. Chuck became the Saab Dealer for Palm Beach County in 1999 and then added Pontiac and Volkswagen at the West Palm location in 1999 and 2000 respectively. Infiniti and HUMMER became a part of the offerings in 2001 and Mitsubishi joined the West Palm Beach location in 2007. Chevrolet was added to the line up at the Northlake location most recently. In 2002 Chuck was honored by the Florida State Commissioner of Education, Tom Horne with the Commissioner’s Business Recognition Award for the organizations contribution of facility, internship opportunities and the support of an automotive instructor at the Automotive Career Academy. In the fall of 2003 Chuck received the inaugural Chairman’s Award of Excellence presented by the North Palm Beach Chamber of Commerce, recognizing him for the contributions that he and the company have made, and continue to make, to Palm Beach County. Chuck and the organization were honored with the 2004 Business Athena Award, a national award presented to individuals and companies recognized for their professional accomplishments, philanthropic and community service, and for their unique initiatives to provide leadership opportunities for women. Chuck was the recipient of the Northwood University Dealer Education Award in the spring of 2005 for his contributions to the education of the primary, secondary and post secondary students of our community. Chuck was the recipient of the General Motors Dealer of the Year Award for the fifth time in 2008. The award was presented in New York City, where he was honored with 108 other General Motors Dealers from around the country. Chuck was inducted into the Junior Achievement Business Hall of Fame and recognized as their Pioneer Laureate for 2006. In February 2007, Chuck received the Time Magazine Quality Dealer Award. The Time Magazine Quality Dealer Award is the automobile industry’s most prestigious award for automobile dealers, recognizing their success and their demonstration of a long standing commitment to effective community service.